A senior private sector economist applies a standard method to measuring trade barriers. The results cast doubt on the notion that EU membership has a much bigger positive effect on UK-EU goods trade than might be generated by a free trade arrangement. While there is certainly evidence that the removal of tariffs in the 1970s had a significant impact, it is far from clear that there have been large effects either from the customs union element of the current relationship (which would largely relate to removing rules of origin requirements) or the single market element. And for services trade, the evidence of a big positive effect on UK-EU trade is very limited. Ahead of and following the UK’s referendum in 2016 on EU membership, there has been a lively debate about the costs and benefits of possible future trade arrangements between the UK and EU. Much of the debate has revolved around estimates of the extent to which bilateral UK-EU trade has been boosted by EU membership. Many studies have examined this by using ‘gravity’ models which relate the degree to which one country trades with another to variables such as geographical distance and economic size, with a variety of other control variables (including language and historical links) usually added. Some studies based on the gravity methodology have suggested that EU membership has boosted UK-EU trade by very large amounts, up to 100% (the most prominent being that produced by the UK Treasury in 2016). Such studies also often suggest that EU membership has a bigger positive effect on trade than other possible trade arrangements such as membership of the European Economic Area (EEA), free trade agreements (FTAs) or a fall back to ‘WTO rules’ (i.e. trading on the basis of MFN tariffs). Another finding of some of these models is that EU membership has caused limited or even zero trade diversion, i.e. deflection of UK trade from other possible trade partners to the EU. The scale of the effects of EU membership on UK trade with the EU generated by some studies using gravity models has been questioned by several authors, in particular Gudgin and Coutts (2017) whose work suggests the estimated effects may be exaggerated by methodological flaws. Our purpose is in this report is also to examine the claims of large EU membership effects on UK trade and the superiority of EU membership relative to other trade arrangements. But we use a different methodological approach. The centrepiece of our paper is a set of estimates of bilateral trade barriers between various pairs of countries generated by the approach of Novy (2011). Novy’s approach has been dubbed the ‘reverse gravity’ method and was recently used by Springford (2017) in the context of trade barriers between the UK and EU. Our work confirms some of Springford’s key results and extends them in a number of directions. 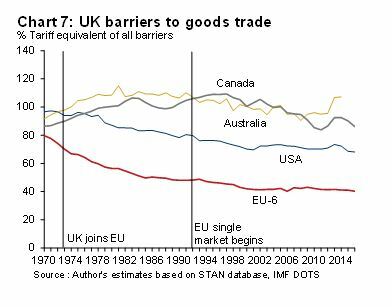 Trade barriers in goods between the UK and the EU-6 have fallen significantly since the early 1970s, and by more than trade barriers between the UK and other partners such as the US and Japan. However, the bulk of the decline took place in the 1970s and 1980s reflecting the removal of initially quite high tariff barriers. Some of this decline would have happened anyway due to multilateral trade liberalisation and some may also have been due to lower natural trade barriers. The decline in UK-EU trade barriers since the inception of the EU single market in the early 1990s (which also led to the removal of customs checks) has been much shallower with the decline over the last decade small. This implies relatively modest economic benefits to the UK from the single market programme – a finding also supported by other studies. Barriers to trade in services between the UK and EU look much higher than for goods. 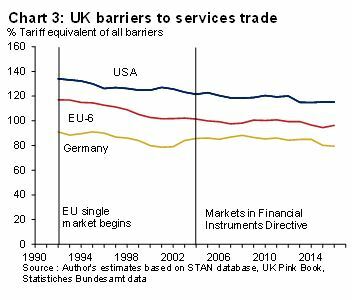 These barriers declined modestly in the 1990s but have changed little since the early 2000s, despite EU directives aimed at creating a single market for services and the advent of financial market ‘passporting’. 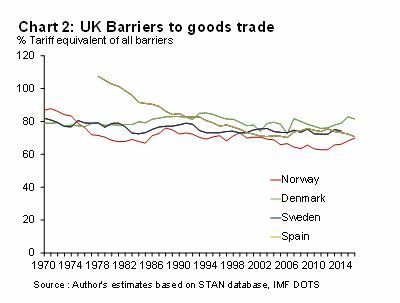 The level of trade barriers between the UK and some of its former partners in EFTA such as Norway, Sweden and Denmark, does not seem to have changed much since the 1970s. This again implies relatively little bonus to the UK from single market membership, although it may also reflect some trade diversion from these partners to the EU-6 after the UK joined the EU. 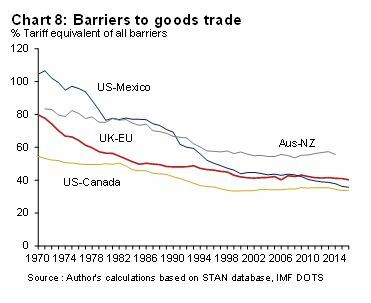 The level of trade barriers between the US and its NAFTA partners, Mexico and Canada, looks similar to that between the UK and the EU-6. This is despite NAFTA being an FTA rather than a customs union or single market. The steepest decline in trade barriers since the 1970s has been between Mexico and the US, much of which pre-dated the NAFTA agreement and reflected large unilateral tariff cuts in Mexico. 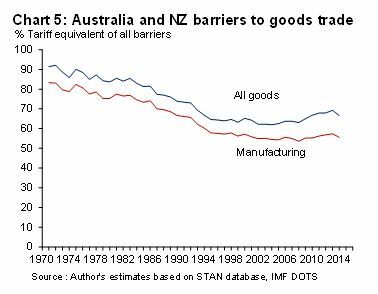 The Australia-New Zealand FTA-based trade agreement has also been associated with a considerable fall in trade barriers since the 1970s, to levels broadly comparable with those measured between the UK and EU-6 in the 1990s, despite a much greater geographical separation. Early evidence using our method suggests that the EU-Korea FTA has led to a considerable fall in trade barriers between the UK and Korea, suggesting the FTA-based trade arrangements can have considerable positive effects on trade. Our approach suggests trade barriers between the UK and Commonwealth trade partners such as Australia, New Zealand and Canada rose sharply after the UK joined the EU. This does not support the notion that EU membership had limited or no trade diversionary effects. Overall, our results cast some doubt on the notion that EU membership has a much bigger positive effect on UK-EU goods trade than might be generated by a free trade arrangement. While there is certainly evidence that the removal of tariffs in the 1970s had a significant impact, it is far from clear that there have been large effects either from the customs union element of the current relationship (which would largely relate to removing rules of origin requirements) or the single market element. And for services trade, the evidence of a big positive effect on UK-EU trade is very limited. The ‘reverse gravity’ approach used by Novy (2011) attempts to estimate all bilateral trade costs, including tariff and non-tariff barriers and ‘natural’ costs related to geography and language and cultural barriers, between pairs of countries. The approach infers these costs from trade and output data in the pairs of countries and expresses the result as an ad valorem tariff equivalent. Full details of the formula used and the data sources can be found in the technical appendix. A key advantage of this approach is that it is based on a relatively small number of actual historical trade and output series and is not subject to the major methodological challenges of standard gravity models. These challenges have resulted in dramatically different estimates of the trade effects of EU membership and other trade agreements being generated, depending on the precise estimation approach taken. Gudgin and Coutts (2017) point to a number of flaws in the gravity approach used by the UK Treasury in 2016, including biases created by large numbers of small countries with low levels of trade. Meanwhile, Walsh et al. (2006) find that EU membership has a positive and significant effect on services trade flows if OLS estimation is used but a negligible and insignificant impact if the HTM estimation approach (which they consider statistically superior) is used. Using the ‘reverse’ gravity approach, Springford (2017) noted that goods trade barriers between the UK and the EU-6 dropped considerably in the 1970s-1990s but had changed relatively little since around 2000. He interpreted this as suggesting the single market had ‘reached its limits’. Springford also made two other key observations. First, estimates for trade barriers between the EU-6 and Switzerland were similar to those for the UK and the EU-6. This implies that Switzerland’s approach of being outside the EU customs union and single market but closely integrating with the EU via a range of bilateral deals has put Switzerland in much the same position as EU member the UK. Second, Springford showed that barriers to services trade between the UK and EU-6 were much higher than barriers to goods trade and also that there was little evidence these barriers had come down since the early 2000s. His conclusion was that the UK post- Brexit should aim for a trade deal focused on goods, perhaps modelled on the Swiss arrangement. Our approach is similar to Springford’s but extends his work in a number of important directions. First, we extend his estimates to a broader set of countries, enabling us to investigate changes in goods trade barriers between the UK and other trading partners and changes in barriers between other pairs of countries who are part of free trade arrangements, notably the NAFTA members and Australia and New Zealand. Second, we are able to extend his analysis of barriers to trade in services between the UK and EU-6 back further, to the early 1990s, using alternative data sources. Our first step is to replicate the estimates in Springford (2017) of barriers to trade in goods between the UK and the EU-6. Like Springford, we also find that trade barriers between the UK and EU-6 (Germany, France, Italy, Belgium/Luxembourg and the Netherlands) declined significantly from 1970 to the early 1990s: the ad valorem tariff equivalent of all trade barriers fell from around 80% to around 50% (see Chart 1). This makes sense in the context of the removal of what were initially quite high tariff barriers between the UK and EU-6 (around 8-11% on average, see Bown and Irwin (2015)). But not all of this decline can be ascribed to EU membership and some of it would have occurred even if the UK had not joined the EU. The 1970-1992 period was one where global trade barriers were generally declining. The world average tariff fell from around 14% to 4% over this period helped by a series of multilateral trade agreements. 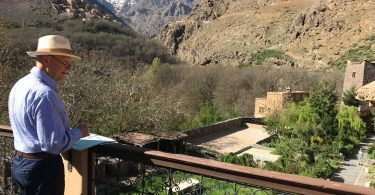 ‘Natural’ trade barriers also came down – containerisation and other developments cut transport costs and advances in information technology slashed communication costs. 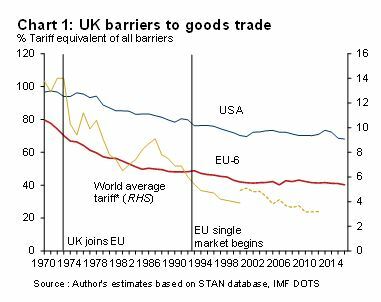 Illustrating these points, our estimates for trade barriers between the UK and US over the same period also show a significant fall albeit only half as big as the fall in barriers between the UK and the EU-6. Trade barriers between the UK and the EU-6 have continued to fall since 1992, but at a much slower pace. By our estimate, the ad valorem tariff equivalent of all barriers has fallen by around 10% points in this period – actually slightly less than the decline we find in UK-US trade barriers over the same period. Since the year 2000, there has been almost no change. 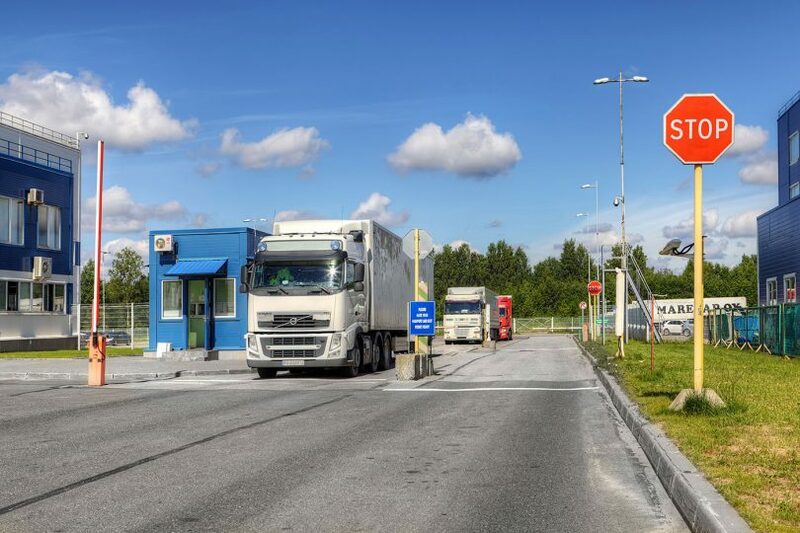 The year 1992 marked the inception of the EU’s single market programme, which aimed to reduce non-tariff barriers to trade between EU members and also led to the abolition of routine customs checks. It might have been expected that this programme would have cut trade barriers between the UK and the EU-6 considerably, but our results do not point in this direction; at best they suggest a rather modest impact, at worst it is not easy to see any effect over and above what could be a general ‘globalisation’ effect (there is also likely to have some reduction in trade barriers in this period due to the opening of the channel tunnel). While this conclusion may seem surprising, it should be noted that since 1992, UK exports of goods bound for the EU have declined both as a share of total UK exports and as a share of UK GDP (Slater (2016)) – in contrast to the experience of other EU members. Moreover, other studies such as that by Bertelsman (2013) also find a relatively modest impact of the single market on UK output per head, at just 1%. A further piece of evidence suggesting modest effects from the single market programme on trade barriers comes from our estimates of trade barriers over time between the UK and its former partners in the EFTA trade agreement, such as Denmark, Norway, Sweden and Switzerland. We find very shallow or even no declines in trade barriers between the UK and these states since 1970, when tariff-free trade on industrial goods already existed between the UK and this group (see Chart 2). Again, there are also few signs of a decline since the single market programme of the 1990s (Norway, while not an EU member, is a single market member via its EEA membership, while Switzerland is a de facto member via a series of bilateral agreements). By contrast, a marked decline in trade barriers between the UK and Spain is visible in the 1980s and 1990s. Spain was not an EFTA member and prior to its joining the EU maintained relatively high protective barriers. We now turn to services trade, very important in the context of the UK because services exports are a large share of UK exports, approaching 50%. Barriers to services trade generally take the form of non-tariff barriers (for instance, related to regulatory differences and obstacles) but might also be expected to have declined among EU countries as the result of various EU initiatives such as the Markets in Financial Services Directive of 2004 and the services trade directive in 2006. Using the reverse gravity method, Springford (2017) found that barriers to trade in services between the UK and EU-6 were somewhat higher than goods trade barriers and had changed little since the early 2000s. Using alternative data sources (see technical appendix) we have been able to extend the time period for studying services trade barriers back to the early 1990s. We find evidence of a moderate decline in services trade barriers between the UK and EU-6 from 1992-2004, but little change since. Indeed, since the early 2000s, services trade barriers between the UK and the US have fallen slightly faster than those between the UK and the EU-6. We also calculated services trade barriers between the UK and Germany over the same time period. The results are again interesting – services trade barriers with Germany appear to have barely changed at all since the early 1990s. 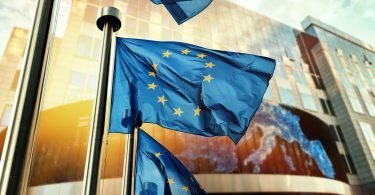 The apparent lack of any decline in services trade barriers since 2004 is significant as that year saw the introduction of the Markets in Financial Services Directive, a key foundation stone of the ‘passporting’ system that aims to ease EU financial institutions’ ability to sell products across borders. Much importance has been ascribed to the passporting regime in boosting UK financial services exports, but our analysis does not appear to support this view. In this section, we present estimates of barriers to goods trade between other pairs of countries which are party to free trade agreements (FTA), as distinct from the combination of customs union and single market that makes up the EU. We first look at the members of the North American Free Trade Agreement (NAFTA), the US, Canada and Mexico. This agreement was put in place in 1994. Our results suggest that goods trade barriers between the US and Canada and the US and Mexico have fallen significantly since 1970. Interestingly, the biggest declines came before the inception of NAFTA in 1994. In the case of Canada, the biggest decline came during the 1980s, including after the US-Canada trade agreement in 1987. Declines since 1994 have been relatively modest. In the case of Mexico, there was a very steep decline in barriers in the 1970s and 1980s which in part reflected unilateral tariff cuts by Mexico (often from high levels). 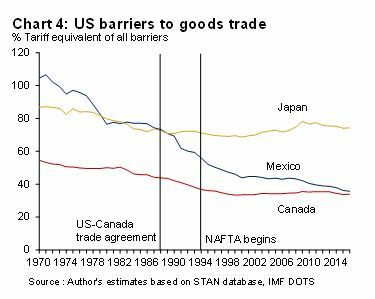 The decline in US-Mexican trade barriers has continued since 1994, at a somewhat faster pace than the drop in US-Canadian barriers. Perhaps the most striking finding here, though, relates to the estimated current level of trade barriers between the US and Canada and the US and Mexico. Our estimates suggest the level of trade barriers is comparable to that seen between the UK and the EU-6, even though on paper NAFTA is a somewhat looser trade arrangement, not featuring either a customs union or single market and having traditional customs borders and rules of origin checks on goods. One possible factor here is that ‘natural’ trade barriers between these countries are lower than between the UK and EU-6, although the difference seems unlikely to be very large. As such, our estimates imply that the looser NAFTA framework has delivered a similar degree of trade integration between its members to that which exists between the UK and the EU-6 in the context of EU membership. We have also produced estimates for trade barriers between Australia and New Zealand, which have been engaged in a process of economic integration since the 1970s under the ‘Closer Economic Relationship’ (CER). Our estimates suggest a considerable drop in trade barriers since 1970, especially for manufacturing, where the ad valorem tariff equivalent has fallen from 83% to 55% (this is likely to be the better indicator of trade integration as fluctuating commodity prices bring some noise into calculations using all goods). This latter figure is arguably impressively low, given the geographical separation of the two countries – over 4000km. A final piece of analysis in this section looks at trade barriers between the UK, Korea and Japan. The Korea-EU FTA of 2011 abolished most tariffs on UK-Korean trade, a significant liberalisation given Korea’s average tariff on imports from the EU was around 6% at the time (EU parliament (2015)). 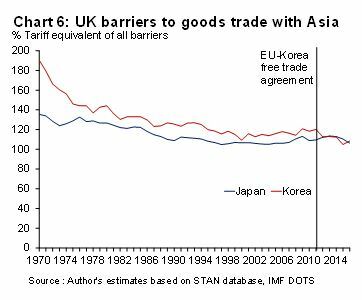 Our estimates of UK-Korean goods trade barriers since then suggest a notable decline. The ad valorem tariff equivalent has fallen by twelve percentage points from 120% to 108%. By contrast, we estimate UK-Japan trade barriers have changed little over the same period. Did EU membership cause trade diversion? As noted in the introduction, a claim made in some parts of the literature on UK-EU trade is that the UK’s joining the EU did not lead to any (or to very little) trade diversion. Using the reverse gravity method, we can examine this claim by estimating barriers to trade in goods between the UK and Australia and the UK and Canada. These were two of the UK’s pre-1973 trading partners that benefitted from Commonwealth trade preferences which disappeared after 1973. Our estimates suggest the UK’s EU membership led to a steep rise in trade barriers between the UK and these two countries. In 1970, the level of trade barriers was similar to that between the UK and the EU-6 (despite the much greater geographical separation). But by the mid-1980s, trade barriers between the UK and Australia and the UK and Canada had risen by the equivalent of around a 20% tariff. This rise is especially striking given the general decline in international trade barriers (including natural barriers such as transportation) in this period. With UK-EU-6 trade barriers falling significantly over the 1970s and 1980s, the change in the preference margin in favour of trade with the EU was very large and it would be remarkable if there had not been very large trade diversion effects. Standard trade data seem to bear this out, with the share of UK trade accounted for by these countries dwindling steadily and the UK’s share in Australian and Canadian trade doing likewise. A further implication of our results is that there is considerable scope for these trade diversion effects to unwind again should the UK liberalise trade with these markets in the future (the recent EU-Canada FTA will be an interesting test of this – it is too soon for any effects of this to be seen in our analysis). Our analysis of movements in trade barriers using the ‘reverse gravity’ method yields a number of key results. The first of these is that most of the decline in goods trade barriers between the UK and the EU-6 took place in the 1970s and 1980s, before the single market programme, with the effects of the latter relatively modest and hard to disentangle from globalisation and declines in ‘natural’ trade barriers. For the UK at least, the EU single market (which it should be noted also led to the abolition of routine customs checks within the EU) does not seem to have had a very strong additional integrationist effect. The second is that for services trade, EU membership appears to have had at best a very modest impact on trade barriers between the UK and the EU-6. This is in line with findings from other studies that have suggested the EU single market for services is far less developed than for goods and the fact that services trade was never subject to the tariff barriers that existed for goods. So while much attention in the UK currently focuses on the need for a future trade arrangement with the EU that has a significant services component, our analysis suggests this focus may be misplaced. The third key result is that our estimates of trade barriers between the NAFTA states suggests that this trade agreement, much looser than the EU system, has apparently reduced trade barriers to a similar level to those between the EU-6 and the UK. The Australia-New Zealand trade agreements have also cut trade barriers very significantly despite wide geographical separation. The conclusion here is that free trade agreements may be able to deliver much of what the UK might want from a future trade relationship with the EU, as well as increasing trade with non-EU partners not currently in trade agreements with the UK via the EU. ante Estimates with Empirical Evidence. World Economy, doi: 10.1111/twec.12149. Ilzkovitz, F., Dierx, A., Kovacs, V. and Sousa, N. (2007), Steps towards a deeper economic integration: the Internal Market in the 21st century – A contribution to the Single Market Review. European Economy No. 271, European Commission, Brussels. The approach used in this paper to generate estimates of trade barriers is based on that of Novy (2011) and is sometimes described as the ‘reverse gravity approach’. This approach seeks to generate an estimate of all bilateral trade costs, including tariff and non-tariff barriers and ‘natural’ costs related to geography/language/cultural barriers, between pairs of countries. These trade costs are inferred from trade and output data in the pairs of countries, with the result expressed as an ad valorem tariff equivalent. Where xii and xjj are the gross outputs of the manufacturing or services sector of the pair of countries i and j, and xij and xji are the manufacturing or services exports and imports between the pair of countries. The term σ is a constant elasticity of substitution, which following Novy’s example (based on other trade literature) is set to a value of 8. For our estimates, our main data sources were as follows. For bilateral goods trade flows, the IMF DOTS database was used, with trade in goods expressed in current US dollars. For services trade, we used data from the UK Pink Book and for Germany data from the Statistisches Bundesamt. For gross output of goods, the main source was the OECD STAN database. For the US, gross output data came from the Bureau of Economic Analysis. Both the services trade data and the gross output date were converted into US dollars using the appropriate exchange rates. All data were annual. To create complete series running from 1970-2014/16, some series needed to be spliced or grown back with other series. Examples are Germany, where STAN data for West Germany was used to grow back the united Germany data before 1991. For a few series, value-added data was used to grow back gross output series to 1970. This introduces the possibility of some biases, but we do not believe such biases to be significant.